The holiday season is just around the corner and many pet parents want to include the family pet in their holiday celebrations. As you get ready for all the festivities, it’s important to keep your pet’s exercise and eating schedule routine. Also, it’s important to steer pets clear of the following unhealthy treats, toxic plants, and dangerous decorations. Our holiday safety tips will get you and your pet ready for the holidays. Christmas Trees – Be sure to secure and anchor your tree so it can’t tip over and fall. 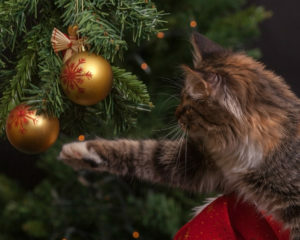 It’s also important to keep the tree water away from your pets because the fertilizers and bacteria in the water can cause major stomach upset and possibly diarrhea. Mistletoe & Holly- Holly, when ingested, can cause pets to suffer nausea, vomiting, and diarrhea. Mistletoe can cause gastrointestinal upset and cardiovascular problems. And many varieties of lilies can cause kidney failure in cats if ingested. Opt for just-as-jolly artificial plants made from silk or plastic, or choose a pet-safe bouquet. Tinsel- Kittens love to play with tinsel because it’s sparkly and floaty. However, this so-called toy can be easily swallowed which can lead to an obstructed digestive tract, severe vomiting, dehydration and possible surgery. Candles- Don’t leave lighted candles unattended because pets can easily burn themselves or cause a fire if they knock candles over. Be sure to put out candles when you leave the room. Wires, Batteries, and Glass Ornaments- Please keep wires, batteries, and glass or plastic ornaments out of paws’ reach. There are many dangers that can befall your pet while these holiday decorations are out for them to get into. A wire can deliver a potentially lethal electrical shock and a punctured battery can cause burns to the mouth and esophagus, while shards of breakable ornaments can damage your pet’s mouth and digestive tract. Sweet Treats- As you know chocolate is a big no-no for dogs. Please make sure all holiday treats that have chocolate or xylitol are kept away from your furry friend. Secure leftovers and garbage cans. Leftovers- Do not feed your pets leftovers from your holiday meals. Obviously, they have pet food to satisfy their appetites. Olsen’s has lots of pet treats for your family pets. Alcoholic Beverages- Christmas and especially New Years most likely will have beverages with alcohol that can be lethal to pets. Make sure to place your unattended alcoholic drinks where pets cannot get to them. If ingested, your pet could become weak, ill and may even go into a coma, possibly resulting in death from respiratory failure. Just like fireworks during Fourth of July celebrations, New Year’s is a time when noisy poppers, blowers, and loud noises are common while counting down to the new year. However, these noisy festivities can terrify your pets and possibly cause damage to their ears. Be sure to secure them in a safe, escape-proof area as midnight approaches. This entry was posted on Thursday, November 15th, 2018 at 3:47 am	and is filed under Cat, Dog, News & Updates. You can follow any responses to this entry through the RSS 2.0 feed. Both comments and pings are currently closed.